For more than 150 years, Associated Bank has been giving back to the community. That long tradition continued on May 21, as representatives from Associated Bank, NEWaukee, the City of Milwaukee, Rinka Chung Architecture and J.H. Findorff & Son Inc. participated in a ceremonial ground breaking event. Speakers at the event included Tom Barrett, Milwaukee Mayor, Ghassan A. Korban, Commissioner of the Department of Public Works, John Halechko, executive vice president, director of branch banking, Associated Bank and Jeremy Fojut, NEWaukee. 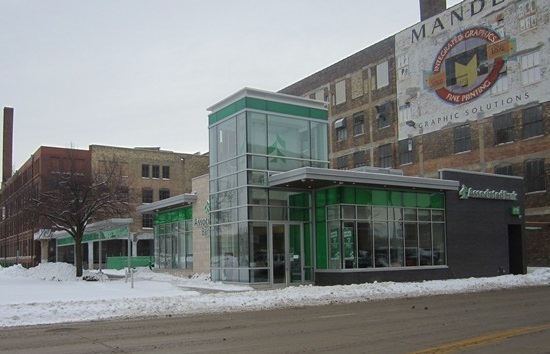 Last month, Associated announced it had completed an agreement with the City of Milwaukee to build a 3,000 square-foot branch location and “pocket” park. The branch location broke ground in April and is anticipated to open in late August of this year. The new branch will offer customers an enhanced banking experience in a revitalized and spacious layout, reflecting the updated Associated brand style. The branch will also offer 24-7 Self-Service banking solutions along with a digital demonstration zone allowing customers to sign up for online banking and interact with Associated Bank’s mobile applications. In honor of the neighborhood’s history, Associated Bank has teamed up with the City of Milwaukee and NEWaukee to bring a public park to this corner of Martin Luther King Jr. Drive and McKinley Avenue. The park will be located to the south of the new branch and will feature public spaces and seasonal events coordinated by NEWaukee. Earlier this year, Associated and NEWaukee announced a year-long partnership to increase young professional community engagement and development in the city of Milwaukee and southeastern Wisconsin to increase city vibrancy and company branding. Media coverage can be found here: Milwaukee Business Journal, Urban Milwaukee, WITI-MILW (FOX), Milwaukee City and Press.